This comprehensive and practical reference is the perfect resource for the medical specialist treating persons with spinal cord injuries. 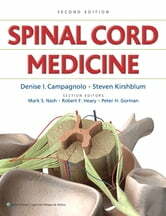 The book provides detail about all aspects of spinal cord injury and disease. The initial seven chapters present the history, anatomy, imaging, epidemiology, and general acute management of spinal cord injury. The next eleven chapters deal with medical aspects of spinal cord damage, such as pulmonary management and the neurogenic bladder. Chapters on rehabilitation are followed by nine chapters dealing with diseases that cause non-traumatic spinal cord injury. A comprehensive imaging chapter is included with 30 figures which provide the reader with an excellent resource to understand the complex issues of imaging the spine and spinal cord.